1. Place 100ml water into a large bowl, add the cyder vinegar, salt, maple syrup, garlic and caraway seeds and mix well. Add the cabbage, stir well then transfer all to an airtight container and chill overnight. 2. Cook the potatoes in boiling water for 10-12 minutes until tender but still holding their shape. Drain well and leave to cool for a few minutes. 3. Mix together the horseradish and mayonnaise. Place the potatoes in a serving bowl and gently toss with the mayonnaise mixture and cress. 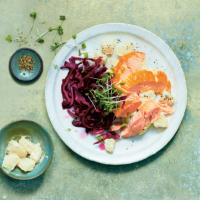 Serve with the pickled red cabbage and hot smoked salmon. Cook’s tipThe pickled red cabbage can be stored in an airtight container in the fridge for up to 3 days.